Nearly two dozen high school students are circled around an examination table in Rush’s human anatomy lab as James Williams, PhD, the lab’s director, removes a large mass from a human cadaver and holds it up in his blue surgical-gloved hand. It’s a fatty tumor, a benign growth the size and shape of a small football. After the students pass around the tumor to examine it, Williams has several of them take turns cutting it open with a scalpel. These sorts of lessons are common in the human anatomy lab, located behind a locked door on the fifth floor of Armour Academic Center. The 34 human cadavers currently lying on tables in the lab’s three adjoining rooms are the remains of people who arranged with the Anatomical Gift Association of Illinois (AGAI) to have their bodies donated to science after their death. Provided on loan from the AGAI, the cadavers are used primarily to teach the human anatomy course for first-year Rush Medical College students, but they also are part of the curriculum for a wide variety of other Rush University academic programs, including physician assistant, speech pathology and audiology classes. “Anyone who’s a student here, we try to get them here at least once,” says Anthony Serici, laboratory coordinator. In recent years, the lab also has become a popular destination for area high school classes. An average of one class a week, drawn from the suburbs and city schools near Rush, visit the lab. 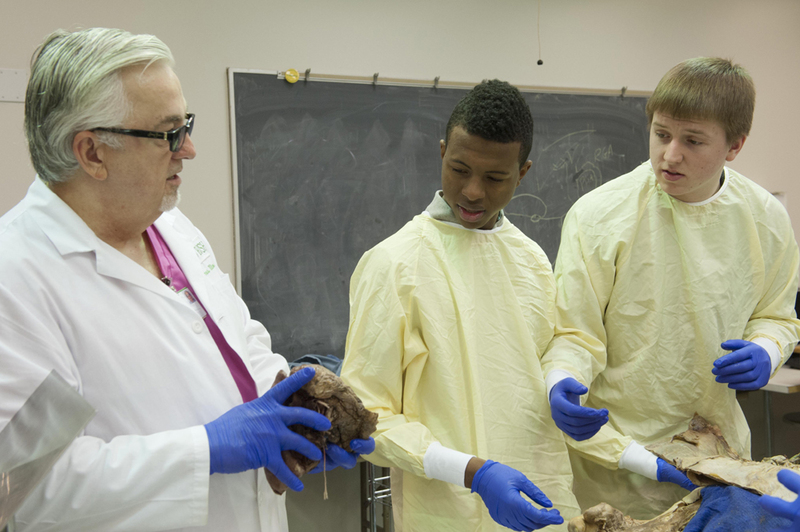 It also hosts college students, including the anatomy and physiology class at neighboring Malcolm X College. On this Tuesday morning in late February, the lab is hosting 86 students enrolled in either the medical career or sports medicine class at York Community High School in Elmhurst. Coincidentally, Williams lives in Elmhurst, a western suburb – his children went to York, and one of the students visiting the lab lives on his block. Williams has begun the visit with an opening talk in which he tells students that taking a college anatomy class was one of the two most important experiences in his life (the other was meeting his wife). He then has instructed the students to unzip the body bags containing the cadavers and begin examining them – a prospect that’s caused understandable nervousness in some students. “All right, we’re doing it. Oh man,” one young man says, rocking back and forth on his heels but not quite able to bring himself to start unzipping the bag. During the course of the morning, the joking and trash-talking of the male students suggests they’re considerably more nervous than their female classmates, who go about their business with quiet concentration and no evident squeamishness. It probably helps that the cadavers’ faces are kept covered in a show of respect. Wearing yellow surgical gowns and blue gloves given to them on their arrival, the students look over the cadavers, guided by three York teachers and an Elmhurst veterinarian who’s volunteered his assistance. Williams makes the rounds from table to table, making observations, asking questions, giving the students opportunities to try their hand at suturing shut an incision in a cadaver. Tall, white-haired, goateed and dressed in hot pink scrubs, Williams is a commanding presence, and his presentations combine a sense of drama, sensitivity and humor. “We took his rib cage out and saw this, and we thought, ‘my goodness, this guy grew a second set of ribs,” he says, pointing to something shielding the chest cavity. He then reveals that it’s actually the outer lining of a lung that was inflamed by asbestos. For the students, who are considering various careers in the health sciences, the look into the human body is a revelation. “We learn about individual systems, then you come here, you can see it all together,” says Natalie Heinle, a senior who will be attending Michigan State University in the fall and plans to major in nursing. About 90 minutes after their arrival, the students shed their gowns and head back to the bus that will return them to school. “If we see each other in Elmhurst, say hello,” Williams calls to them as they depart. The number of bodies donated to science has been decreasing over the past 10 years. For more information about donating your remains to science, please visit www.agaillinois.org. Nice work Jimbo. Important work. I think that it provides the students a great deal when they are able to explore something along with learning it. This holds so for medicine as well. Hence, I applaud this effort!